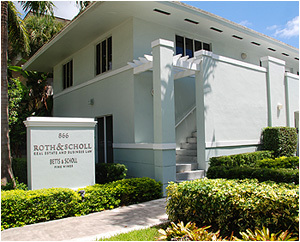 Roth & Scholl has developed a reputation for legal expertise and integrity in handling a wide array of real estate and business matters throughout the state of Florida on behalf of national, regional and local businesses, institutions and individuals. We are dedicated to providing the highest quality legal services and advice in an efficient, timely and cost effective fashion. We pride ourselves on maintaining close personal communication with our clients, and on our accessibility to our clients at all times. Roth & Scholl is engaged in a broad-based civil trial practice, specializing in real estate, business law and complex commercial litigation.